How about a searchable Facilitator database with geography, services and reviews? Since many of us will now need to exclusively utilize their services, I'd like a convenient way to access them. @JLS_Comics i think that is a great idea. To me that’s the hardiest part with me is finding someone that’s going to a particular show that I want a signature from. VS me sending it to someone and they hold it forever because I’m not sure when that person is rolling through. @comicsforme What makes you the judge of who is or who isn't a real collector? There is a Facebook group I joined recently where people post asking for a facilitator or notifying the group that one is available for certain shows. I only joined the group recently so U can't speak to quality yet but it does exist. There is something similar on the CGC forums in regards to witnessing requests. Maybe CBCS should start a designated one here. I think JLS’s suggestion is a good one too. So stupid question here, but just to confirm, we can still get a yellow label slab cracked, add a signature, and submit for a yellow label again so long as its cracked by an AW and the label/paperwork are submitted to CBCS, right? This is A LOT better in my opinion. It is a fair and reasonable compromise. Thank you Mark and CBCS! Great move even though I mainly get 10 or more. Additional update posted by Mark Roman on March 9th, 2018 on Facebook. IN-HOUSE PRESSING: Invoice submissions that need pressing services are to be done separately from submissions that do NOT require pressing. Any ASP book submitted with 10 or more signatures will be charged an additional $5 processing fee. ASP books with 20 or more signatures will have an additional $5 fee added on again. The reason for this increase in processing fees is the length of time required to check each signature and date associated with the books. The minimum submission of books from CBCS approved witnesses (Personal-Use AW & Facilitators) is still 5 per show (previously changed from 10, as the minimum). Personal Use AWs are not allowed to have their books travel to other events to add signatures, unless the additional signatures are handled by a Facilitator, with proper documentation (multi-event forms). · Facilitators & Personal-use AWs must submit all books within 10 business days of the last signing event, submissions after 10 days risk not qualifying for an ASP (yellow label) designation. · Facilitators submitting books with incomplete submission paperwork or turning in books inside of window-cut bags, will have a $1/book surcharge added to that submission. Effective March 1st, 2018. **Personal Use AWs must apply for AW status a least two weeks prior to the signing event. How does AW work if CBCS is at the convention? Only asking as I have a diner with Steranko where 3 items can be signed -guessing CBCS won't be there so I have started the paper work to get AW status. Would I still be able to then witness my own books the remainder of the convention and just hand books and paperwork to the CBCS table for return to the shop for grading? He would be happy to answer your questions. It's funny what the mind sees at a quick glance. Thanks - already have AW paper work sent back with a few questions - just thought I would check here too! You'll have a great time with Steranko. He's an awesome man. I wanted to clarify something regarding the new rules for the ASP. Based on the emails I’m receiving some people are thinking that they have to submit a minimum of 10 books to have them yellow labeled. That is not the case as customers wanting yellow label books can still walk up to the CBCS booth with just one book, ask for a witness and get it signed and submitted. They can't if you all aren't at the con. I've never seen CBCS at Knoxville Comic Con here in Tennessee. With all due respect, this rule is punishing the honest collectors who attend many of these smaller cons while fattening the wallets of the facilitators. Thats not right. I had met David Finch last weekend and was approved as an AW for the event. I've already sent my books in for grading however I had missed the portion that says David Finch has to have managers initials on the form to get a yellow label. I was not charged as I'm active military stationed here overseas. So because of this am I now screwed on getting a yellow label for my books? I've been looking but can't find the list of what people require what i.e. initials etc. - anyone have a link?? Oh wait...if maybe I opened my eyes!!! Found it! Looks like that is a few months old - any updates? What's the appropriate method to submit for a yellow labeled art/commissioned piece that was done in Nov/Dec but only just picked up from the artist this weekend? Do you put the date information from when the piece was actually done, or when it was actually received from the artist? Never submitted an art piece before so not sure the best way to go about it. Is it just treated the same as an witnessed signature? @fivestar Contact Mark Roman of CBCS. His e-mail is in the OP of this thread. There is a form that the Artist should fill out. He can provide the form and instructions on how to submit the art. I have my approved AW form from Mr. Roman (check!) - when getting my books signed I inform the artists that I am AW for CBCS (check!) - do I have to have my on-line order form pre-filed/payed so if they want to initial the paper work they can? Or do I just get books signed then fill out order forms to send in with my books later? So perhaps a new section broken down by state of reliable and approved witnesses and their approval list of conventions they'll be attending or broken down by conventions. This could definitely be doable if broken down properly. 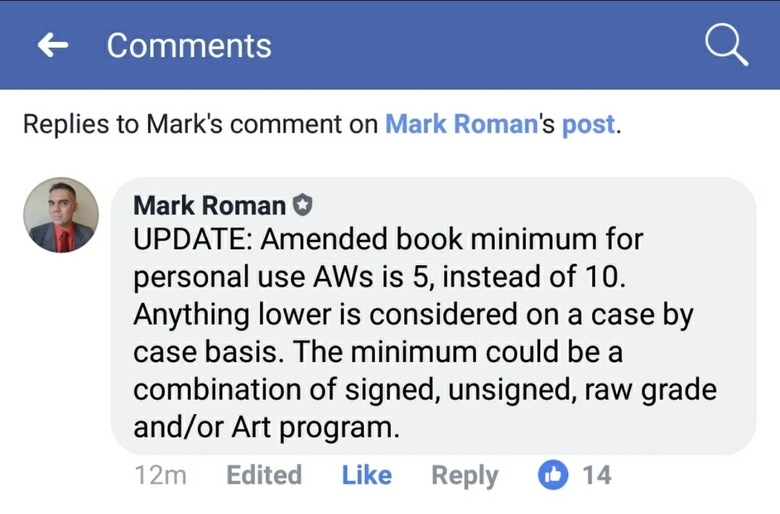 10-18-2018 Mark Roman announced a change on Facebook. After hearing many of you out & carefully taking into consideration, the time needed to process orders for other witnesses & customers, CBCS has decided to extend your books to be submitted to CBCS to 30 days, after getting your books signed, instead of 10 business days. International Facilitators will now have 60 days. We hope this helps. Personal-Use AWs, still have 10 business days, to turn books in after obtaining signatures. I can speak highly about this dude, along with Ryan Hicks and Kevin.